Wild Diamonds Fun Casino (in conjunction with Cloud 9 Events) is proud to be providing the pre dinner casino games entertainment for the Casino Royale Ball at the University of the Sunshine Coast. Please check links at the bottom of this page for instructions on how to play the games. There will be a trophy for the best player. An evening of glitz, glamour, gambling and live entertainment all night. Want to bond with your classmates? Get yourself a licence to thrill. 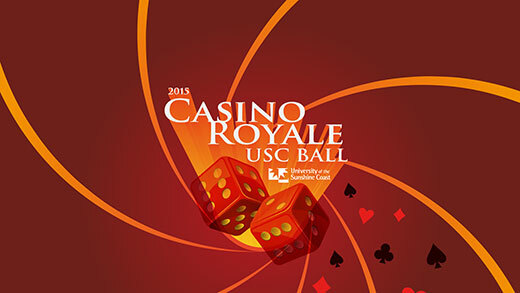 You’ll be shaken and stirred at the Casino Royale USC Ball. ALL AGES event. As this is a licensed event, you will need to bring photo I.D. Tickets are just A$30 each, or if you get some friends together and buy a table of 10 you will get a discount on your tickets at A$280 for a table. Includes a two-course buffet dinner, and bubbles or mocktail on arrival. If you have already booked and would like to know how to play some of the games that will be on offer, please click on any of the following links. How the Fun Casino works. Croupiers can also explain the games to you at the tables if you have any questions or are not sure how to play. Suncoast Hinterland Softball Association “60’s & 70’s Fun Casino Night”.